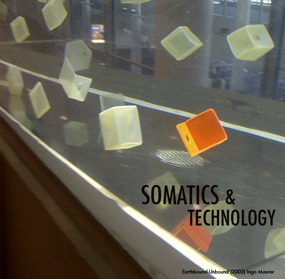 Somatics & Technology Conference and Workshop :: June 22-23, 2012 :: University of Chichester, UK :: Call for Papers, Artworks, and Presentations — Deadline: April 28. The first conference of its kind in the UK to disseminate a spectrum of digital arts linked with the Somatic, this event will integrate advanced critical and theoretical perspectives. Through keynote presentations, papers, roundtable discussions led by keynote speakers, a series of workshops and an art exhibit, the conference offers the opportunity for both practical and theoretical understanding of its theme. Keynote speakers and workshop leaders include Jean-Louis Boissier (Université Paris 8), Susan Kozel (Malmo University), Isabelle Ginot (Université Paris 8), Contact Improvisation artist Nancy Stark Smith and Quebec digital performance artist Isabelle Choinière. Nancy Stark Smith will be conducting The Global Underscore Event, an annual event during which dancers at many sites around the world practice the Underscore simultaneously. A special issue of the Journal of Dance and Somatic Practices, Intellect Press will publish a peer-reviewed edition of the proceedings. Eds. Prof. Sarah Rubidge and Dr. Andrea Davidson. Publication in 2013. Conference Registration forms are available here. Call for papers, presentations, and artworks are currently underway, the deadline for these is 28 April.